Frey says the Hispanic population, "which until very recently was heavily clustered in places like Los Angeles or Miami or Chicago or New York, are now really starting to spread out to other parts of the country." That migration has shifted the population balance in nearly one third of all U.S. counties, where now, at least five per cent of the residents are Hispanic. "So a lot of suburban counties, a lot of exurban counties, that used to be all white are now getting new Hispanics and in some cases Asians and African Americans," Frey says. "And what this does is give much of America a first taste of what diversity is like." William Frey says that traditionally minorities have tended to be less mobile than whites, settling in places where they had friends and family who provided support, but now they, too, are more likely to choose where they live based on economics. "It has to do with lower cost of housing," he says. "It also has to do with the availability of jobs. Many of the jobs they are taking are jobs that require people with low skills, jobs in construction or services in retail. And the jobs are being created by people who moved there before, more middle-class folks." Hispanics who are looking to fill those jobs are moving to cities like Las Vegas, Nevada; Phoenix, Arizona; and Orlando, Florida. As for African Americans, they too, are looking for greater economic opportunity. Their grandparents and great-grandparents left rural areas in Mississippi, Alabama and Georgia for jobs in New York and Chicago, but they're returning to the South. And while Blacks have been moving to the south since the 1990s, William Frey says the most recent data indicate that trend has gotten stronger. "Something like 72 per cent of the nation's growth in the black population is taking place in the South," Frey says. "I think it has something to do with a cultural comfort zone. I think there is this long-term connection that African Americans feel with that region that they don't quite have with the other parts of the country." 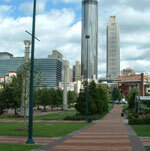 The number one destination for African Americans in the South is Atlanta, Georgia, a city with a large black middle class. Wherever there is economic growth in the country, the minority population is growing as well. It's a different story in much of the Midwest and mountain states, which are still predominantly white. Frey explains that in those areas, the population is aging. "These tend to be places, the parts of the country, that aren't growing very fast," he says. "In other words, the people who live there are people who were left behind after a lot of other folks have moved to the fast growing sunbelt parts of the country. So they are getting older and whiter and the rest of the country is getting more diverse." • Hispanic and Asian populations are spreading out from their traditional metropolitan centers, while the shift of blacks toward the South is accelerating. The Los Angeles and New York metropolitan areas contained 23 percent of the nation's Hispanic population in 2004, down from 30 percent in 1990. Meanwhile, interior California areas such as Riverside and Stockton gained significant numbers of Hispanics and Asians. Fully 56 percent of the nation's blacks now reside in the South, a region that has garnered 72 percent of the increase in that group's population since 2000. • The fastest growing metro areas for each minority group in 20002004 are no longer unique, but closely parallel the fastest growing areas in the nation. National growth centers such as Las Vegas, Atlanta, Orlando, and Phoenix are now prominent centers of minority population growth as well. Still, Hispanics, Asians, and blacks remain more likely to reside in large metropolitan areas than the population as a whole. • Of the nation's 361 metropolitan areas, 111 registered declines in white population from 2000 to 2004, with the largest absolute losses occurring in New York, San Francisco, and Los Angeles. Declines were greatest in coastal metropolitan areas and economically stagnant parts of the country. More so than for minority groups, white population growth has dispersed towards smaller-sized areas. • Minorities contributed the majority of population gains in the nation's fastest-growing metropolitan areas and central metropolitan counties from 2000 to 2004. Minority groups remain the demographic lifeblood of inner counties in older metropolitan areas, but they are increasingly fueling growth in fast-growing outer suburban and "exurban" counties as well. • A strong multi-minority presence characterizes 18 large "melting pot" metro areas, and 27 large metro areas now have "majority minority" child populations. Because the nation's child population is more racially diverse than its adult population, in nearly one-third of all large metro areasincluding Washington, DC, Chicago, Phoenix, and Atlantafewer than half of all people under age 15 are white.